Despite the government’s efforts to prevent alcohol abuse, alcoholism still remains the number one problem of most nations. In the US alone, almost 17 million adults are suffering from alcohol-related problems. There are almost 90 thousand people who die of alcohol-related problems which are supposed to be preventable. Alcoholism does not only affect the alcoholic itself, but also ruins the person’s relationship with his or her family, friends and colleagues. The intensity of an individual’s alcohol dependence may vary from one person to another; some are severe while some may be hardly noticeable. This article will tell you the different signs of alcohol dependence and in case you notice any of them on your loved ones or even on yourself, don’t be afraid to ask for medical help. Most alcoholics and problem drinkers deny how much and how often they drink. This is to prevent other people from making an issue of their condition. This symptom is hard to spot but this is a major sign that a person has a bigger problem. Using alcohol in order to relax is one of the most important signs of alcoholism. Some drink alcohol to relieve themselves from stress and anxiety, but this is very risky because alcohol is a habit-forming substance. The “relief” that alcohol brings is only temporary, and believing that alcohol is the solution to all your problems is a sure way of messing up your life. There is nothing wrong if a person wants to have fun and a few drinks, that’s part of having fun anyway. But if a person you know experiences blackout each time you drink, this is a sign that the person has a more serious problem. Blackout is the state where a person drinks alcohol excessively to the point that he or she doesn’t remember anything that happened before getting drunk. Always remember that nobody has to drink too much to have fun, so there might be a more sensitive reason why a person is doing this. One of the red flags in alcoholism is when a person cannot control the amount of alcohol he or she drinks. For example, when you open a bottle of wine, you can’t stop drinking until you have finished the whole bottle. That’s one of the major symptoms of alcoholism. When you still drink alcohol even if your doctor told you that you can’t because you’re on medication only implies that alcohol is more important than your life. Another example is drinking before going to work or drinking even if you know you are going to drive. 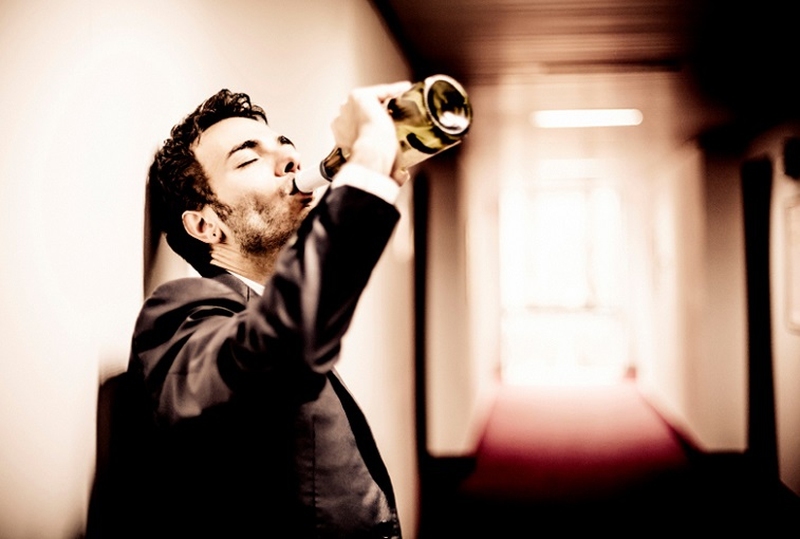 These behaviors indicate that your priority in life is alcohol and nothing else. You may not readily notice it but alcohol will someday ruin not only your life but also your family. This is a consequence of any addiction and alcohol is not an excuse. For example, instead of helping out in household chores, you are always sleepy because you are drunk. Besides, instead of using your money for your family’s welfare, you spend it to buy alcohol. Alcohol may also affect your way of thinking and when this happens, you might be unconsciously hurting your loved ones and this might make them move away from you. Some people are very proud when they tell their friends that they have a high tolerance to alcohol. This is one of the major symptoms of alcoholism. When you need to drink more alcohol than you used to before in order to feel tipsy, it only means that your body has developed tolerance to alcohol because it is always exposed to it. It is a good sign when you finally decide to control your urges to drink. This means that you understand how alcohol can destroy you physically and emotionally. It also means that you are aware that you have a drinking problem. But if you are trying to stop yourself but you can’t, you might be experiencing a bigger struggle with alcoholism. When this happens, don’t be afraid to reach out to your friends and family, or better yet, seek professional help. Alcohol will definitely affect you physically. Some of the signs are dry skin, brittle hair and nails, flushing, skin aging, alcohol-smelling breath, absence of personal hygiene and yellowish skin and eyes which suggests liver problems. When signs of liver dysfunction start to show up, it is also possible that alcohol has also affected the brain. One of the major signs of alcoholism is when you begin to make alcohol the center of your life. Alcohol not only affects your body but also your mind making your way of thinking irrational. Some evident signs are when you begin to spend all your time and money drinking even if you go penniless. Another sign is when you prefer to hang out with other alcohol drinkers than with friends and family who do not drink. When you are suffering from alcoholism, alcohol will conquer your life and will take away your true happiness and loved ones. When alcohol begins to take away your normal life, you will also begin to let go of the things you used to love. This can be because you are no longer physically capable because of the effects of alcohol in your body. It can also be because you don’t have the time and energy anymore because you are always drunk or still recovering from your hangover. When your body has become so used to alcohol, it will begin to react violently when you try to stop drinking. This is called the withdrawal syndrome. One of the major symptoms of alcoholism is the manifestation of withdrawal symptoms such as tremors, anxiety, irritability, physical fatigue, depression, headache, loss of appetite and insomnia. Some alcoholics get drunk even in the morning in order to cope with their withdrawal symptoms.